Happy Seminar New Year! Our awesome designer at QT Office created a tracking sheet for our unit and area websites and we are excited to share it with you! Click on the image below to download and print your Mary Kay® Queen’s Court of Sharing Double Credit Tracking Sheet. If you’re looking to kick off the Mary Kay Seminar New Year with a new unit website filled with amazing training and daily special recognition, now is the time because we are having a sale! We only have a limited amount of space available so if you’re ready for a website give us a call at (888) 440-7247, Line 2, or visit us online. We are passionate about offering on trend and beautiful mobile responsive unit websites designed to take your unit to the next level, all at affordable prices. Our website plans are $25-$65, and we have no contracts or cancellation fees. You can follow us on Facebook, Twitter, Pinterest, Instagram and stay connected by subscribing to our email list on the right! BOO-Tiful Fun Mary Kay® Ghost Hostess Sheet! Halloween is the perfect time of year for fun and games! 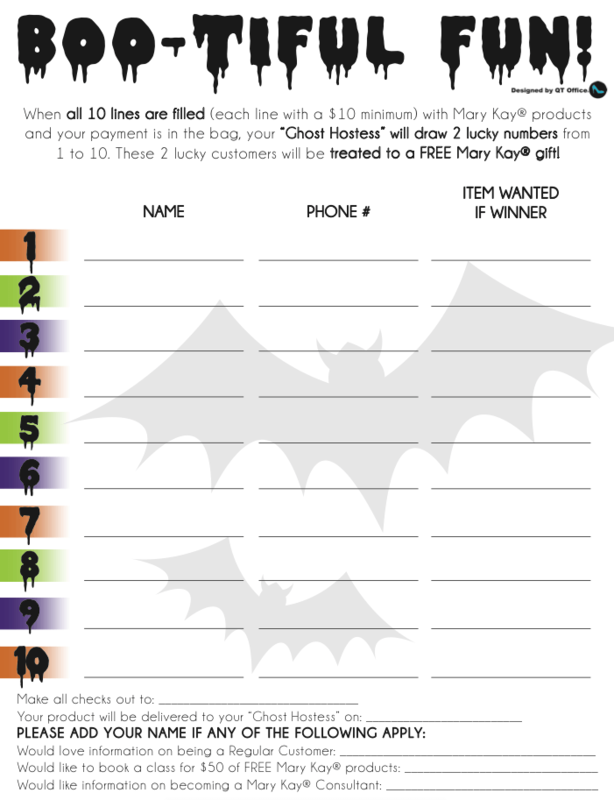 Get your Mary Kay® customers in the holiday mood with this fabulous Halloween themed BOO-Tiful Fun Mary Kay® Ghost Hostess Sheet! This BOO-Tiful Fun sheet is a fantastic way to gain new contacts, customers, and even consultants! No one can resist a chance to win a FREE Mary Kay® gift! You can find this festive BOO-Tiful Fun Mary Kay® Ghost Hostess Sheet in the Seasonal Selling section of QT Office’s® Unit Websites for Mary Kay® Directors and Nationals! Are you interested in more sheets like this one? 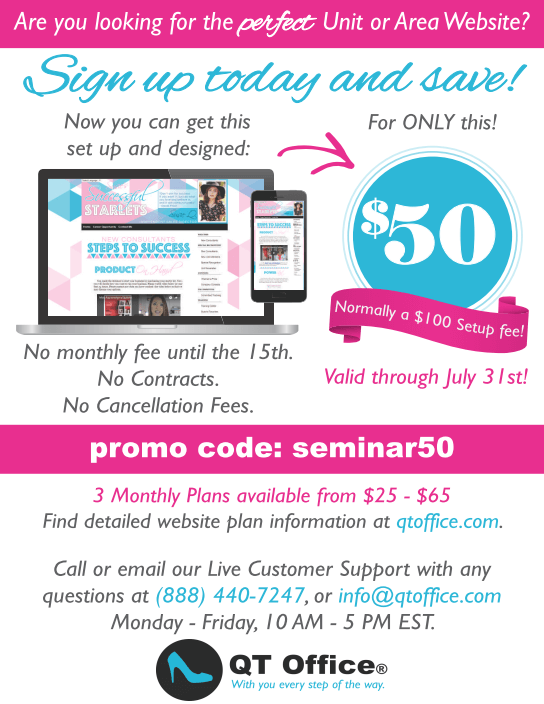 Sign up for a Unit Website for Mary Kay® Directors and Nationals TODAY with QT Office®! We have sheets like this and much more in our fabulous Training Center and Seasonal Selling pages! Contact us today! When using the flyers or social media posts created by QT Office, we ask that you please make sure you check all social media guidelines on www.marykayintouch.com when promoting your business to follow the best practices. Woo Hoo! Mary Kay® just released their new Fall products. The team at QT Office has designed a super sharp flyer for you to share the products with your customers, family and friends. 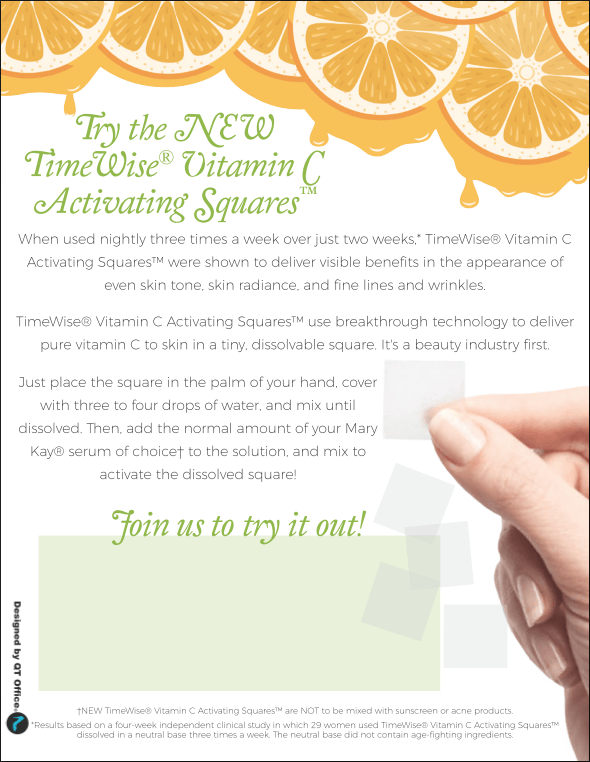 Use this flyer as a booking tool to get your hostess to schedule a time to try all the latest products including the new TimeWise® Vitamin C Activating Squares. We have a great flyer with an editable text box for your information you can use as an invitation! As always we will be featuring this sharp fall product flyer along with other great flyers in the Seasonal Selling section of our Unit and Area Websites. Wow Mary Kay’s® new Vitamin C Squares are a beauty industry first! Mary Kay’s® new Vitamin C Squares are a beauty industry first! This amazing Vitamin C square is fresh EVERY Time! Pure vitamin C degrades & loses its power over time when exposed to air, light or water. That problem is solved with a breakthrough in technology that keeps the PURE Vitamin C stable until you unlock its power with every use! The designers at QT Office have created this flyer with an editable text box for your personal information for you to share with your customers, family and friends. Of course we will be featuring this along with other great flyers in our seasonal selling section of our Unit and Area Websites. The designers at QT Office have created this amazing dashing towards director tracking sheet featuring the new seminar 2018 director suits. 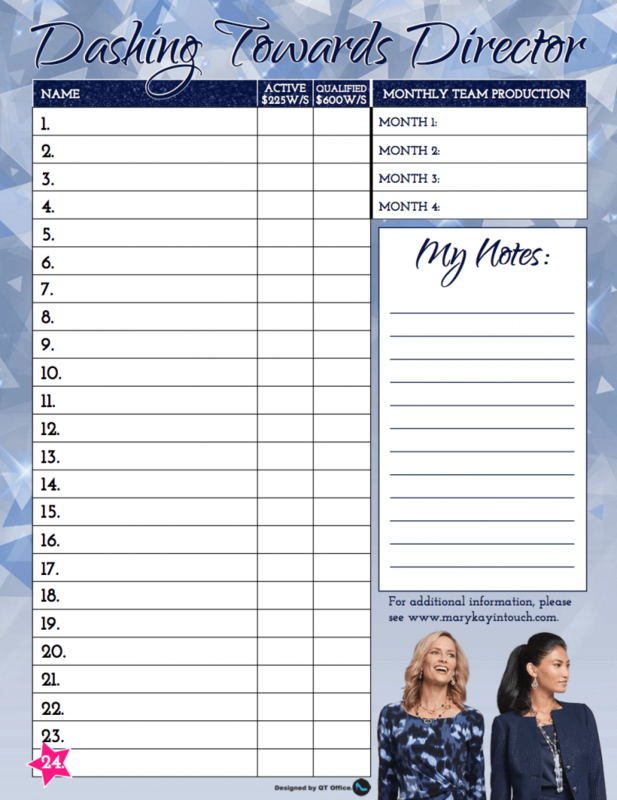 This is the perfect tracking sheet to help you keep up with you progress as you move closer and closer to Directorship. In a glance you’ll know where you are and how much more you need to go. 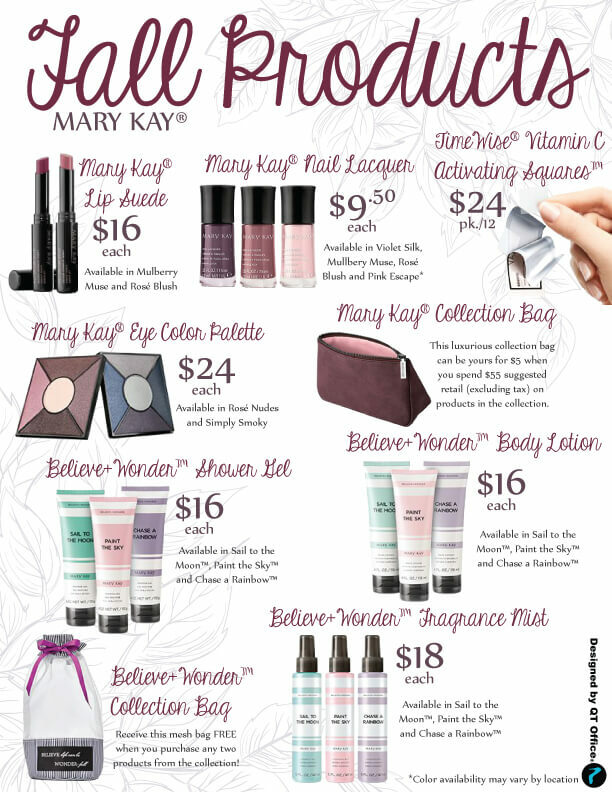 Want FREE flyers for your Mary Kay Business? Copyright 2015. QT Office® is not affiliated with or endorsed by Oprah Winfrey or Mary Kay® Inc.